The meniscus is the name given to the cartilaginous tissue of the knee joint. When this cartilage is torn it causes significant pain and loss of mobility. Some meniscal injuries can heal on their own with rest and at-home care, but in some cases surgery is needed to repair the injury. The meniscus is a flat piece of cartilage in the knee joint. It is sandwiched between the heads of the femur and tibia, providing the joint with shock absorption and also making it more stable. However, while the knee joint is generally quite strong, the meniscus is actually very vulnerable to damage, and it can be torn easily if the knee is twisted. In fact, meniscal tears are one of the most common injuries injuries to affect the cartilage of the knee. Injuries to the meniscus are particularly common in contact sports that involve movements such as jumping and sudden changes of direction while running. For instance, soccer and volleyball are two sports where there's a high risk of meniscal injury. People who suffer a meniscal tear while playing sports often injure other parts of the knee, such as the anterior cruciate ligament, at the same time. Older people, especially older athletes, also have an increased risk of injury to the meniscus. This is because cartilage becomes more brittle and weaker with age, so there's a higher chance it will be torn in a fall or other accident involving the knee. For many people, a minor tear to the meniscus can be repaired with rest, anti-inflammatory medication, and other simple measures. However, tears that are large or unstable may need more in the way of treatment. When this is the case surgery to repair the meniscus is often the best option. This kind of surgery is often carried out using arthroscopy, in which a miniature camera and surgical instruments are used to repair the meniscus. This surgery is less invasive than open surgery because it can be performed through small incisions that heal more quickly. Some meniscal tears can be repaired by stitching the torn edges of the meniscus together, but not all tears can be treated in this way. For example, if the torn pieces are highly fragmented it's difficult for stitching to be effective. 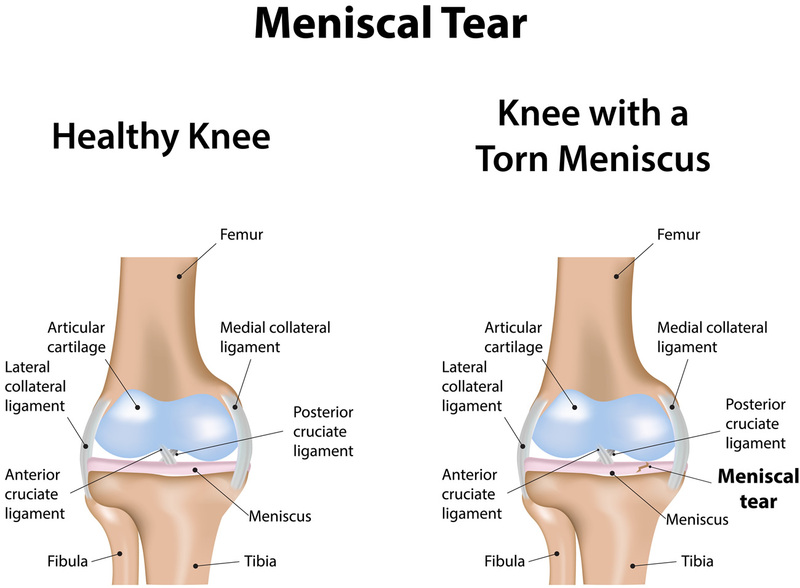 Another consideration is that it's harder to repair long tears that extend through the centre of the meniscus, but the central part of the cartilage has no blood supply. This means it's less able to heal itself. After meniscus repair surgery it typically takes around 6 weeks for full recovery. However, this depends on the extent of the damage to the meniscus, and other factors, and for some people recovery may be faster or slower depending on their circumstances. During recovery it's important to keep up with physical therapy exercises and other measures that help your knee get stronger without putting stress on the meniscus. You may also need to wear a brace or cast, or use crutches, for a few weeks. This is necessary to keep the knee stable and allow the meniscus time to heal without having to bear too much weight. The majority of people who have meniscus repair surgery have good results in the short term. However, in the long term, someone who suffers an extensive injury to the meniscus has an increased risk of developing arthritis in the affected joint. This means it's important to take care of the knee, and if possible, to avoid activities that pose a high risk of further injury to the knee.